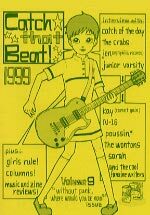 A supercool Riot Grrrl zine by Yayoi. I first read about her in an interview she did with Good Girl #2 (Canada) and I was so thrilled, I immediately emailed her and she sent me her lovely zine. I just love her cover of the summer 2000 "That Zine That Would Be Queen" issue! Check her web site (the zine and the web site are mostly in Japanese) and what she has to say in this interview! My name is Yayoi, I'm twenty six and live in Tokyo, Japan. I grew up in a town where suburbs of Tokyo. I'm going to move to Melbourne, Australia next year. Please let me know if you live there, and take me to 'hip' places. I started to play the guitar lately! I made some early issues with some girls for a while, but they are gone, I've been the only editor for about six years. I'm working on #11 now. I really liked reading zine before I start CTB!, but I've never thought of having my own zines. 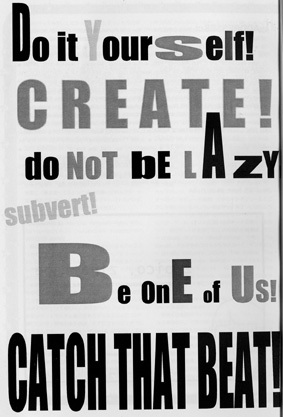 In 1995, a big major record label wanted some kids to do a fanzine for a German band called Throw That Beat! 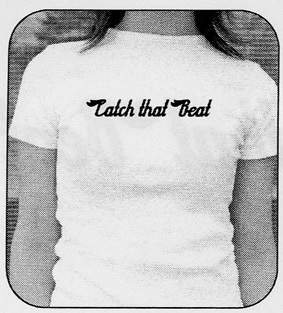 so me and three other girls started 'Catch That Beat!' But our taste was very different. They left and I kept doing CTB! on my own. I wanted to do something for girls, something political. Well, CTB! is kind of a personal zine so that I just do the interview with my favorite bands, and write my favorite/curious things. I hope,,, to create a space where we talk out our beliefs, desires, and emotions. We don't have a scene for girls who love indie pop/rock/punk in Japan, so I admire that. What does zine making (and reading) mean to you? What do you love about zine making? What is the most challenging aspect of making zines? I have been making the new issue, I most of my time in front of my mac on weekend. It's stressful, but I love what I do. And I love reading/meeting womyn and girls who like CTB! zine, it always cheers me up. I didn't know much about zines/bands before reading Beikoku Ongaku magazine. They had a page called OHISAMA HIROBA (Sunshine Playroom) which we could read a tons of reviews and address for bands, and indie record labels. I used to send letters to zine makers and labels. I think zines are important. zine community... i have friends who make zines, but I don't know the zine community. so I can't answer this question. Anyway, Lets start up right now! It's never too late To start from the start. Pocket, Sally Tomato, Two Pico. Unfortunately, we don't have such community.... Two Pico. 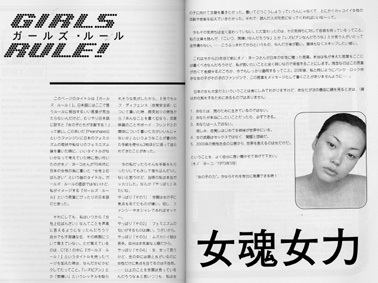 is kind of grrrl zine, but I don't know whether Tomomi (zine publisher) defines it. I liked KIT POW, SNIP YOUNG STAR, but they stopped publish them a few years ago. I really hope that girls start making zines!!! Yes, I totally do. I am a feminist!!! I've been thinking about my health recently. 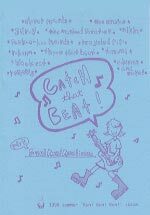 I do publish Catch that Beat!, I think it's my activism. What do you think about feminism today? Do you see yourself as part of Third Wave Feminism and what does it mean to you? It's very difficult to find books by young feminists in Japan, I hope this situation will change in the near future. I can't imagine my life without the internet now....It became more easy to do the interview, get pictures/articles from bands and contributors, and I often get information via the internet. I will publish the new CTB! in Fall.